It is often thought that consciousness has a qualitative dimension that cannot be tracked by science. Recently, however, some philosophers have argued that this worry stems not from an elusive feature of the mind, but from the special nature of the concepts used to describe conscious states. 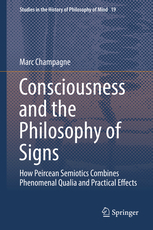 Marc Champagne draws on the neglected branch of philosophy of signs or semiotics to develop a new take on this strategy. The term “semiotics” was introduced by John Locke in the modern period – its etymology is ancient Greek, and its theoretical underpinnings are medieval. Charles Sanders Peirce made major advances in semiotics, so he can act as a pipeline for these forgotten ideas. Most philosophers know Peirce as the founder of American pragmatism, but few know that he also coined the term “qualia,” which is meant to capture the intrinsic feel of an experience. Since pragmatic verification and qualia are now seen as conflicting commitments, Champagne endeavors to understand how Peirce could (or thought he could) have it both ways. The key, he suggests, is to understand how humans can insert distinctions between features that are always bound. Recent attempts to take qualities seriously have resulted in versions of panpsychism, but Champagne outlines a more plausible way to achieve this. So, while semiotics has until now been the least known branch of philosophy ending in –ics, his book shows how a better understanding of that branch can move one of the liveliest debates in philosophy forward.